The ocean can be a pretty perilous place, what with all manner of hungry predators waiting to strike at every turn. But while many organisms choose to travel in large groups as a way of protecting themselves from being eaten, one genius fish has found that it's sometimes smarter to drop out of schools and join a posse instead. Meet the Pilot fish, a little swimmer with some big friends. This species, measuring around a foot in length, can be found throughout the world and is recognizable by the six or seven vertical stripes on its body – but the most striking thing about them is the company they keep. Pilot fish are part of one of nature's most fascinating mutualistic relationships, guarding themselves from threats by tagging alongside sharks. 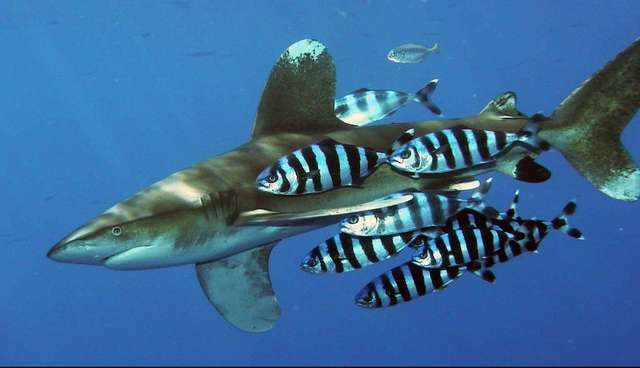 And in a remarkable show of restraint for an apex predator, sharks have come to not only tolerate, but welcome pilot fish into their inner circles without eating them. 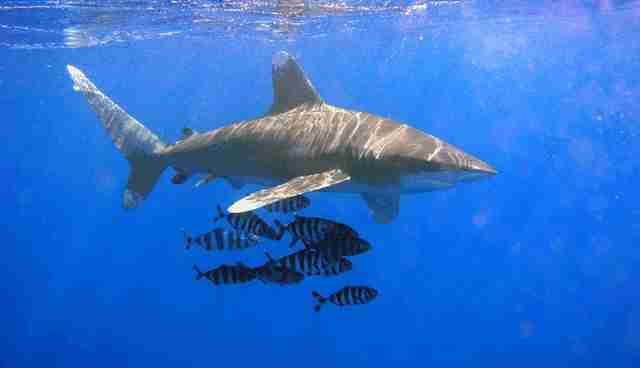 In return for the protection, pilot fish keep the shark free of harmful parasites and clean up bits of excess food. In fact, such is the level of trust between the animals that pilot fish are even known to enter their shark's mouth to nibble away food debris. "The beautiful little fish called the pilot-fish, which always accompanies the shark, has been known to follow a ship for six weeks after the shark to which it belonged was taken!" Chances are better than not that the fish weren't acting out of concern, however. Pilot fish are known to swim along with other things bigger than them, like manta rays, sea turtles, and even the occasional boat. But when it comes to making powerful friends, nothing beats a shark.